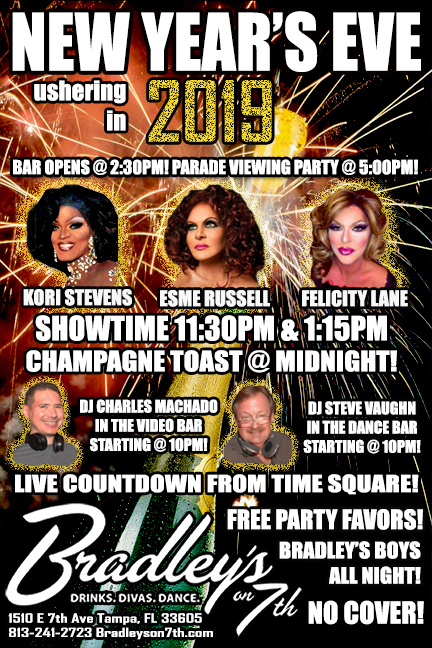 New Year's Eve Ushering in 2019 at Bradley's on 7th! Join us to usher in 2019 at Bradley's on 7th! 2 shows at 11:30 pm and 1:15 am featuring Kori Stevens, Esme Russell and Felicity Lane! DJ Charles Machado in the video bar and DJ Steve Vaughn in the dance bar at 10 pm! Free champagne toast at midnight! Doors open at 2:30 pm for pre-parade partying, get here early to get a good spot on our 7th Ave patio for the Outback Bowl Parade watch party starting at 5 pm then join us to usher in 2019 at Bradley's on 7th! 2 shows at 11:30 pm and 1:15 am featuring Kori Stevens, Esme Russell and Felicity Lane! DJ Charles Machado in the video bar and DJ Steve Vaughn in the dance bar at 10 pm! Free party favor and champagne toast at midnight!